Practical mattress designed for baby cribs 57 x 117 cm model Oxi Ecus. It is a mattress that has two different faces: - entrainment face made of super-soft 3D - Face comfort fabric made from highly breathable and fresh bamboo, ideal for summer. The mattress comprises a core Origena HR open pore that.. Practical for baby crib mattress 60 x 120 cm ECU Oxi model. It is a mattress that has two different faces: - entrainment face made of super-soft 3D - Face comfort fabric made from highly breathable and fresh bamboo, ideal for summer. The mattress comprises a core Origena HR open pore that makes the .. 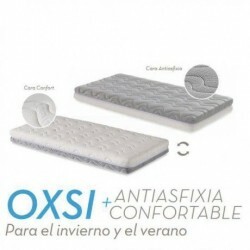 Practical mattress designed for maxicuna baby model 70 x 140 cm ECU Oxi. It is a mattress that has two different faces: - entrainment face made of super-soft 3D - Face comfort fabric made from highly breathable and fresh bamboo, ideal for summer. The mattress comprises a core Origena HR open pore th..
Model crib mattress manufacturer Goli gray Ecus trip. It is a high-quality mattress, which ensures better sleep baby as it is manufactured in one piece. No deformation and is highly breathable, because its cover is made with 3D fabric designed to promote oxygenation of the mattress. The mattress cor..
Minicuna mattress designed for model Organic Mini brand mattresses ECUs. Why Buy Organic Crib Mattress Mini? Because it is a high quality mattress, made with organic cotton fabric, free of pesticides and harmful substances. Ideal for the baby to have a quality rest from birth. Mini Organic Mattress ..